This article is about the 2005 video game. For the 2017 video game of the same name, see Star Wars Battlefront II (2017 video game). Star Wars: Battlefront II is a first- and third-person shooter video game based on the Star Wars film franchise. Developed by Pandemic Studios and published by LucasArts it is a sequel to 2004's Star Wars: Battlefront and the second game in the Battlefront series. The game was released in PAL regions on October 31, 2005, on the PlayStation 2, PlayStation Portable (PSP), Microsoft Windows, and Xbox platforms, and in North America on November 1 of the same year. It was released on the PlayStation Store on October 20, 2009, for download on the PSP. The PSP version was developed by Savage Entertainment. The game features new vehicles, characters, game mechanics, maps, and missions compared to the original Battlefront. Unlike its predecessor, Battlefront II features a more narrative-based campaign, retelling portions of the Star Wars story from the point of view of a veteran Imperial Stormtrooper, reminiscing about his tour of duty in service of both the Galactic Republic and as part of the Galactic Empire. Gameplay additions over Battlefront include the use of Jedi, additional game modes such as hero assault, and objective-based space battles. Battlefront II was well received, with the PlayStation 2 and Xbox versions scoring in the mid 80s at aggregators GameRankings and Metacritic. The PC version scored slightly lower at both sites, scoring a 76.60% at GameRankings and 78 at Metacritic. The PSP version was the worst received, scoring 70.93% at GameRankings and 69 at Metacritic. Reviewers generally praised the narrative-based story; however, some felt that the upgrades from the original were not enough to merit the price. Like the original game, it was a commercial success. GameSpy Technology scheduled a shut-down across all titles using the service for May 31, 2014, which included Star Wars: Battlefront II for PC, PS2, and Xbox. Electronic Arts announced it would extend support for Battlefront II until June 30, 2014. The extended support ended on July 25, 2014, taking all GameSpy online video games across all platforms offline. The Windows version was added to a list of supported games on GameRanger on May 31, 2014, which allows for continued online play. On October 2, 2017, multiplayer for the Windows version was again enabled, allowing for Steam and GOG cross-play. As of April 26, 2018, Battlefront II is now backwards compatible on the Xbox One and has enhanced graphics for the Xbox One X.
Battlefront II is fundamentally similar to its predecessor, albeit with the addition of new gameplay mechanics. The general objective in most missions is to eliminate the enemy faction. Like its predecessor Star Wars Battlefront, the game is split into two eras: the Clone Wars, with battles taking place between the Galactic Republic and the Confederacy of Independent Systems, and the Galactic Civil War, where battles between the Rebel Alliance and Galactic Empire take place. Players have the ability to choose between six classes during gameplay. Four class types are common to all factions; infantry, heavy weapon, sniper and engineer. In addition to the four standard classes, each faction has two unique classes which unlock by scoring a predetermined number of points. For the Rebellion faction, the Bothan Spy and the Wookiee; for the Empire, The Officer and The Dark Trooper; for the Republic, the Commander and the Jet Trooper; and for the CIS, the Magnaguard and the Droideka. Battlefront II also features heroes - a special class that allows the player to control iconic characters from the Star Wars universe. Heroes serve as a bonus to players, and are unlocked by meeting certain criteria, such as earning a certain number of points. Differences between Battlefront II and its predecessor include the ability to sprint and the ability to roll forward. In addition to utilizing heroes in conquest matches, the game also features a hero assault mode in which heroes are pitted against villains in a team deathmatch format. In Battlefront II players can battle in space and engage in ship-to-ship combat. Players sabotage enemy capital ships externally by firing at vital systems, or on foot by landing in the enemy hangar. Whereas Star Wars: Battlefront's campaign featured missions dependent on the chosen faction, Battlefront II contains only one campaign, called Rise of the Empire, which is found in every version of the game except the PlayStation Portable (PSP). This set of missions is presented as the narration from a veteran of the 501st Legion, beginning with an attack on the planet Mygeeto during the Clone Wars and ending with the assault on Hoth as depicted in The Empire Strikes Back. There are a total of 18 missions, four of which are optional space missions. The PSP version of Battlefront II does not feature the Rise of the Empire campaign. Instead it features three single-player Challenge modes; Imperial Enforcer, Rogue Assassin, and Rebel Raider. In Imperial Enforcer the player is sent to eliminate indigenous species on several given planets, such as Gungans on Naboo and Ewoks on Endor. Rogue Assassin requires the player to eliminate all Imperial officers on a given sets of planets. Bonus points are awarded for any other kills. Finally, Rebel Raider tasks the player with locating specific objects in a map and returning them to a designated drop point, similar to Capture the flag. Like its predecessor, Battlefront II includes Galactic Conquest. In this mode, the player commands a fleet throughout the galaxy conquering and protecting planets, much like a game of Risk. When two opposing forces reach the same planet, the game switches to the traditional perspective, and the player must eliminate the enemy faction to gain control of that planet. Players gain credits for performing well which can be used to buy new character classes, a new fleet, or bonuses that provide additional support when attacking or defending a planet. While the PlayStation 2 and Xbox versions allow cooperative and competitive battles in Galactic Conquest mode through splitscreen gameplay, the PC version does not. In Instant Action players can choose from any of the game's 24 maps, as well as any available eras and modes. Four other modes are included in addition to the traditional Conquest mode that was found in Star Wars: Battlefront; Hunt mode, Capture the Flag (CTF), which is available in 1-flag and 2-flag variants, Hero Assault and Space Assault. In Conquest mode, players are required to capture and hold strategic points on the map, known in the game as command posts. Players capture command posts by standing near one until its holograph transitions to blue, indicating it is held by their forces. Players can capture both enemy command posts, which are designated red, and neutral command posts, which are white. For enemy command posts, enemy units can continue to spawn in the area until the post is de-energized and turns white. When all command posts belong to a given team, a twenty-second timer begins in which the opposing team must de-energize a command post or they lose. Alternatively, if one team eliminates all opposing reinforcements, they win. In Hunt mode, players take on the role of the species indigenous to the chosen planet, or of a faction opposed to that species. The object when playing as the indigenous species is to repel the opposition, or to eliminate the indigenous species if playing as the opposing faction. In 1-flag CTF, both teams attempt to take a common flag and capture it at the enemy's base. This mode is the only one available on ground maps as well as in space. 2-flag CTF tasks players with stealing the enemy's flag and returning it to their base for points. In Hero Assault players control iconic Star Wars characters which are divided into two teams, heroes and villains. The sole objective is to be the first team to reach the number of required points, with each kill granting one point. 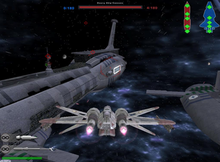 Space Assault allows players to control a starfighter in order to destroy critical systems on the enemy's capital ship or destroy other enemy starfighters for points. The systems of an enemy capital ship can be destroyed in a starfighter by firing at key areas of the ship. Alternatively, players can land in the enemy hangar and sabotage critical systems internally. The game ends when one team has reached the required number of total points. The game is told as an autobiography, with an unknown veteran clone trooper recounting the many battles of the 501st Legion. The 501st begins as part of the large clone army of the Galactic Republic, with the game's tutorial covering the unit's first battle against the Separatist forces during the battle of Geonosis, the very first battle of the Clone Wars. The campaign then skips to the last battles of the war, 3 years later. The first one of these battles is the battle of Mygeeto, where Supreme Chancellor Palpatine of the Republic commands the 501st to destroy an advanced energy generator defended by Separatist forces. During the battle, the clones are led by Jedi Master Ki-Adi Mundi, who helps them significantly in succeeding with their mission. However, unknown to Ki-Adi Mundi or any other Jedi, Palpatine has ordered the legion to collect the remaining samples of the generator to help power his future space station, the Death Star. Meanwhile, the Separatists attack the Republic's capital, Coruscant, and capture Palpatine, resulting in a massive space battle above Coruscant. The 501st take part in the battle as well and are ordered to clear the way of Separatist forces for Jedi Master Obi-Wan and his apprentice Anakin Skywalker, who infiltrate the Separatists' capital ship and rescue Palpatine. On Felucia, the 501st exterminates a small infestation of Acklay inhabiting the planet and fixes an AT-TE they ambushed and damaged, before eliminating the CIS presence in the area, with help from Jedi Master Aayla Secura. Later, on the planet Kashyyyk, the Republic engage a huge CIS fleet in space, with the 501st helping clear a safe path for the Republic forces to land on the planet, although they lose many troopers during the battle. Planetside, the 501st defends a vital Wookiee base from a numerically superior enemy army and, with the support of the Wookiees and Jedi Master Yoda, the Separatists are defeated and the invasion is repelled. In the final mission of the Clone Wars era, the 501st joins the clone forces led by Obi-Wan Kenobi on the planet Utapau to help them with the attack on a major CIS stronghold. During the battle, the 501st encounters the Separatists' leader General Grievous, but they manage to chase him away and then take over the CIS base, while Obi-Wan battles and kills Grievous, thus assuring the Republic's victory. With Grievous dead, the Republic is very close to finally winning the Clone Wars and restore peace to the galaxy. However, immediately after the victory on Utapau, the 501st returns to Coruscant, where Palpatine orders the execution of Order 66. While numerous clone troopers betray and kill their Jedi generals across the galaxy, the 501st participate in the attack on the Jedi Temple on Coruscant, where they massacre all the remaining Jedi guarding their temple, with the help of a new Sith Lord, Darth Vader. With the Jedi Order finally wiped out, Palpatine takes over the galaxy and transforms the Republic into the first Galactic Empire, with him as the Emperor and ruling with an iron fist. With the newly established Empire in power, the 501st becomes known as Vader's Fist, Darth Vader's personal army and, under their new leader, is assigned to various missions to strengthen the Empire's power, first being sent to Naboo to force a regime change by assassinating the Queen and several surviving Jedi Knights seeking protection. Successful in this mission, the 501st are later tasked with destroying a droid manufacturing facility on the planet Mustafar that was reactivated by a Geonosian named Gizor Delso, who betrayed the Empire and tries building his own army to overthrow it. The 501st arrive on Mustafar and, after a space battle with Gizor's forces, they eventually land on the planet's surface and destroy the facility, while also killing Gizor and his entire legion of battle droids. Shortly after, upon learning that the Kaminoans have also betrayed the Empire and created a new batch of rogue clones, the 501st is ordered to destroy their cloning facility on Kamino. The 501st battles the altered clone army and eventually succeeds in their mission, destroying the facility and killing every remaining rogue clone, with the help of the bounty hunter Boba Fett. After this incident, the Empire stops producing clones and instead begins recruiting people from across the galaxy to strengthen their army, thus making the 501st one of the few remaining legions within the Empire made up entirely of clones. With the Galactic Empire firmly established in the ashes of the Republic, the 501st receive orders to be stationed on the Death Star. During their watch a prison break is initiated and, although the 501st battles and kills most of the escaped prisoners, a small group of rebels manage to escape with some vital imperial plans. Tasked to recover the stolen plans, the 501st searches a rebel base on Polis Massa, killing every Rebel standing in their way, but the plans are nowhere to be found. The search eventually leads the 501st to the Tantive IV rebel starship where, with the help of Darth Vader himself, the legion manages to either kill or capture everyone aboard, including the Rebel sympathizer Princess Leia, but the plans are still transmitted and, despite the Empire's best efforts, eventually arrive into the hands of the Rebel Alliance, which then destroyed the Death Star and killed many soldiers still stationed inside, including numerous members of the 501st. The Empire retaliates to the destruction of their battle station by launching a massive attack on the Rebel Alliance's base on Yavin IV, with the 501st taking part in the battle as well, proud to finally avenge all their brothers who died on the Death Star. After a space battle with the Rebel Alliance's fleet, the 501st take the battle on the ground, where they fight their way through the Rebel forces until reaching their base, which they seize and kill everyone inside, thus assuring the Empire's victory and severely weakening the Rebel Alliance. In the final mission of the game, the 501st is pressed into crushing the weakened Rebel Alliance, with the Empire having located their Echo Base on the planet Hoth. The 501st battle their way through the icy fields of the planet and eventually arrive and take over the Echo Base, before destroying the last transports carrying what's left of the Rebel Alliance, once again with the significant help of Darth Vader. The Empire is victorious and the Rebels are finally defeated, but although the clone narrator proudly proclaims that the Rebellion is finished, the game follows the plot of The Empire Strikes Back and the Millennium Falcon escapes Hoth, meaning that there is still hope for the Rebel Alliance. James Arnold Taylor (top) and Tom Kane (bottom) return to voice Obi-Wan Kenobi and Yoda in Star Wars: Battlefront II. The actors have voiced these roles several times in the Star Wars universe. Star Wars: Battlefront II was announced on April 21, 2005, during Star Wars Celebration III held in Indianapolis, Indiana. Developer Pandemic Studios used their in-house engine, known as Zero to develop Battlefront II. The engine was used in Pandemic's other two Star Wars titles, Star Wars: The Clone Wars and the game's predecessor, Star Wars: Battlefront. As with Battlefront Lua was utilized as the game's scripting language. Battlefront II's release date would be set to coincide with the DVD release of Revenge of the Sith, similar to how Battlefront coincided with the release of the original trilogy on DVD. An Xbox demo of Battlefront II was also included on the Revenge of the Sith extras DVD to further promote the game. LucasArts looked to the fans for inspiration for Battlefront II, browsing forums and using other means to provide feedback for the sequel. Josh Resnick, founder of Pandemic Studios noted that it was difficult to get assets from Revenge of the Sith in order to build the related in-game assets. Peter Hirschmann, vice president of product development at LucasArts, detailed the immense efforts required to get the game to a playable state on the PlayStation Portable. "It was a huge 'pop the champagne' day if you got back one whole frame a second," he stated. LucasArts Engineers working on Indiana Jones and Star Wars development teams were brought in to help optimize game code. Bob Bergen voices Luke Skywalker, having voice doubled for Mark Hamill in previous Star Wars games such as the Star Wars: Rogue Squadron series. Voice actor Corey Burton recorded lines for Count Dooku, a role he has played in other Star Wars games as well as the Star Wars: The Clone Wars animated series. Obi-Wan Kenobi is portrayed by James Arnold Taylor, who played the role in the 2002 game Star Wars: The Clone Wars as well as the cartoon series. Scott Lawrence, known for his role as Sturgis Turner in the television series JAG, also returns to voice Darth Vader, a role he has portrayed since the 1990s. 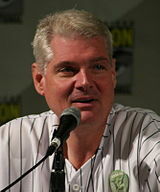 Other veteran Star Wars voice actors such as Tom Kane, Steve Blum and T.C. Carson also provide voice overs. Temuera Morrison portrays his signature roles Boba Fett, Jango Fett and the game's clone trooper narrator, but does not provide the in-game clone chatter as he did in Battlefront. On February 15, 2006, Pandemic released a patch for the PC version, which included support for mods and general improvement to the game. Mod tools for the Windows version of the game were subsequently released on February 21, 2006. Included in the download were many of the game's assets, several tutorials, and the tools required to make content for the PC version of the game. A plugin for Softimage XSI included in the mod tools allows users to create new 3D models and animations for the game. The Battlefront II mod tools provide a wider range of capabilities to the end user than the original Battlefront, allowing a user to create anything from user interface changes, to additional gameplay levels, to large-scale modifications. The original assets used to build the retail version of the game were shipped with the mod tool package that was released and allowed users to either modify an existing level or create an entirely new map from scratch. Subsequently, modifications have been created which expand the game further into the Star Wars expanded universe, adding additional locales, characters, Star Wars eras, and fan-created stories. On December 19, 2005, LucasArts released the first of two downloadable packages for the Xbox version of Battlefront II. The free content added the Hero Assault mode to Kashyyyk. Another Xbox Live download was made available on January 31, 2006, which added two new hero characters, Kit Fisto and Asajj Ventress, as well as four maps from the original Star Wars: Battlefront; Yavin 4: Arena, Bespin: Cloud City, Rhen Var Harbor and Rhen Var Citadel. In addition, Hero Assault modes were also added to Coruscant, Mygeeto, and Naboo. It sold for USD $4.99. The downloadable content is no longer available as the original Xbox Live servers were shut down on April 15, 2010. In late March 2006, the game was added to the Backwards Compatibility List for the Xbox 360, and is now playable on both the original Xbox and the Xbox 360. On May 4, 2014, it was announced that the Star Wars: Battlefront II Online servers hosted by GameSpy were closing down on May 31, 2014. The Windows version was added to a list of supported games on GameRanger on May 31, 2014, which allows for continued online play. On October 2, 2017 a patch was released for the Windows version of the game which re-enables multiplayer and allows for Steam and GOG cross play, with a second patch released on January 3, 2018, which featured minor bug fixes and performance optimizations. A Disney spokesperson told Polygon that GOG Galaxy was "handling the back end for the game’s online play, including the development of patches." Battlefront II was well received overall. The highest aggregate scored was for the PlayStation 2, which holds an 84% at GameRankings and an 84/100 at Metacritic. The Xbox version ranked similarly, with 84% at GameRankings and 83/100 at Metacritic. The PC and PSP versions scored slightly lower, with a 75% and a 78/100 for the PC and the PSP a 71% and 69/100 at GameRankings and Metacritic, respectively. It placed sixth in overall sales for 2005, according to the NPD Group. The PlayStation Portable version sold over 500,000 copies. It was listed as the second most-played Xbox title in 2007, and placed third in 2008. In 2009 Star Wars: Battlefront II reclaimed second place once more. The PlayStation 2 version received a "Platinum" sales award from the Entertainment and Leisure Software Publishers Association (ELSPA), indicating sales of at least 300,000 copies in the United Kingdom. The game's sales totaled 6 million copies by 2007. Battlefront II was praised not only for having a much more engaging single-player storyline, but also for fixing many of the issues that plagued the original. Reviewers noted a slight improvement in the intelligence of AI units and praised new varied objectives to obtain victory. PlayStation World argued the strengthened single-player campaign was "unrelenting" and always a good challenge. Publications found the inclusion of space battles a welcome addition; however, GameSpot argued the addition of Jedi, though looking "good on paper", did not end up "feeling as epic" as expected. Game Revolution argued if the multiplayer was taken away, even the new campaign was not enough to make Battlefront II worth the buy. IGN claimed the game suffers from problems remaining from the original Battlefront, such as a lack of challenging AI characters in single player mode. Computer-controlled opponents and allies tend to run headlong into gunfire, wander off ledges, and walk into walls. IGN felt that these, along with redundant use of planets featured in previous Star Wars settings, were problems carried over from the original. X-Play hosts Adam Sessler and Morgan Webb gave the game a 4 out of 5, but criticized the online multiplayer. Non-video game publications praised the quality of the game. CiN Weekly gave it a score of 92 out of 100 and stated "The improved single-player games are worthwhile enough on their own, but if you can find well connected online matches, multiplayer games will keep you addicted for months." The Sydney Morning Herald gave it a score of four stars out of five, saying, "Space conflict complements ground-based action beautifully and jumping into the cockpit of an X-wing or TIE fighter is thrilling." Detroit Free Press gave the Xbox version a score of three stars out of four and said "The graphics are pretty, the score divine, the story-driven single-player game is actually cinematic and engaging and the lag, while annoying at times online, has been greatly reduced from the original." ^ "GameSpy Multiplayer Shutting Down, Hundreds of Games at Risk". IGN. April 3, 2014. Retrieved April 3, 2014. ^ "ONLINE SERVICE UPDATES". EA. June 1, 2014. Retrieved June 3, 2014. ^ a b Tach, Dave (May 7, 2014). "Star Wars: Battlefront 2 PC multiplayer will continue with GameRanger". Polygon. Retrieved November 29, 2016. ^ a b Chalk, Andy (October 2, 2017). "Star Wars: Battlefront 2 multiplayer restored, now with Steam/GOG crossplay". PC Gamer. Retrieved October 2, 2017. ^ a b "It's Back…And in Even Greater Numbers!". Disney. October 2, 2017. Retrieved October 2, 2017. ^ a b "STAR WARS™ Battlefront™ II updated, now supports Crossplay". GOG. October 2, 2017. Retrieved October 2, 2017. ^ a b c "Star Wars Battlefront II Guide/Walkthrough". IGN. Archived from the original on July 19, 2008. Retrieved August 22, 2014. ^ Pandemic Studios (2005). Star Wars Battlefront II Instruction Manual: Units. LucasArts. p. 15. ^ a b c Dodson, Joe (November 4, 2005). "Star Wars Battlefront II Review". Game Revolution. Retrieved August 22, 2014. ^ a b McGarvey, Sterling (November 1, 2005). "GameSpy: Star Wars Battlefront II (PSP)". GameSpy. Retrieved November 21, 2007. ^ a b c d e f g Pandemic Studios (2005). Star Wars Battlefront II Instruction Manual: Game Modes. LucasArts. p. 21. ^ a b c d Gouskos, Carrie (October 24, 2005). "Star Wars: Battlefront II Hands-On - Single-Player, Galactic Conquest, and More". GameSpot. Retrieved August 22, 2014. ^ a b Pandemic Studios (2005). Star Wars Battlefront II Instruction Manual: Command Posts. LucasArts. p. 13. ^ Narrator: What Ki-Adi Mundi didn't know, however, was that our unit of the 501st was really after an experimental Mygeetan power source. Pandemic Studios. Star Wars: Battlefront II. LucasArts. ^ Narrator: What I remember about the rise of the Empire was how quiet it was ... we all knew what we were about to do. Did we have any doubts? Any private, traitorous thoughts? Perhaps, but no one said a word. Pandemic Studios. Star Wars: Battlefront II. LucasArts. ^ Narrator: Although the Clone Wars were over, some people never seemed to get the message. The worst case of denial was Gizor Delso, a Geonosian Separatist who had somehow escaped Lord Vader's efforts ... Lord Vader tracked him to Mustafar, and brought us in to finish the job. Pandemic Studios. Star Wars: Battlefront II. LucasArts. ^ Narrator: With the information gathered on Polis Massa, Vader concluded that the stolen plans had been given to Princess Leia Organa ... after a brief and pointless battle on the Inventive IV over Tatooine, we began looking for the plans. Pandemic Studios. Star Wars: Battlefront II. LucasArts. ^ Narrator: As the rebels fled the 501st gathered around a burning bunker and let out a cheer that shook the stars. The rebellion was done. Pandemic Studios. Star Wars: Battlefront II. LucasArts. ^ Adams, David (April 21, 2005). "Star Wars Battlefront II Revealed". IGN. Retrieved August 22, 2014. ^ a b Lewis, Ed (July 26, 2005). "Battlefront II in League with Sith". IGN. Retrieved August 22, 2014. ^ "Star Wars: Battlefront 2 Developer Interview". July 20, 2010. Retrieved February 6, 2015. ^ a b c Smith, Rob. Rogue Leaders: The Story of LucasArts. ISBN 978-0-8118-6184-7. ^ a b c d Pandemic Studios (2005). Star Wars Battlefront II: Credits. LucasArts. ^ Plunkett, Luke (July 30, 2010). "The Men And Women Behind Gaming's Most Iconic Characters". Kotaku. Archived from the original on July 31, 2010. Retrieved August 22, 2014. ^ "Lucasarts.com - Star Wars Battlefront II patches". LucasArts. Archived from the original on November 18, 2009. Retrieved November 11, 2009. ^ "Star Wars Battlefront II Mod Tools". Gamers Hell. February 23, 2006. Retrieved November 11, 2009. ^ Bramwell, Tom (December 21, 2005). "Battlefront II Xbox content". Eurogamer. Retrieved July 20, 2010. ^ Bramwell, Tom (January 30, 2006). "Battlefront II content tomorrow". Eurogamer. Retrieved July 20, 2010. ^ Plunkett, Luke (April 14, 2010). "Today, The Original Xbox Live Dies". Kotaku. Archived from the original on April 17, 2010. Retrieved August 22, 2014. ^ Orry, Tom (March 30, 2006). "New games added to 360's backwards compatibility list". videogamer.com. Retrieved July 20, 2010. ^ Dingman, Hayden (April 8, 2014). "GameSpy's shutdown spells doom for numerous PC games, but you can dodge disaster". PC World. Retrieved May 6, 2014. ^ Sarkar, Samit (January 4, 2018). "Here's how 2005's Star Wars: Battlefront 2 was patched this week". Polygon. Retrieved January 6, 2018. ^ a b "Star Wars: Battlefront II for PlayStation 2". GameRankings. CBS Interactive. Retrieved May 4, 2008. ^ a b "Star Wars: Battlefront II for Xbox". GameRankings. CBS Interactive. Retrieved November 21, 2018. ^ a b "Star Wars: Battlefront II for PC". GameRankings. CBS Interactive. Retrieved November 21, 2018. ^ a b "Star Wars: Battlefront II for PSP". GameRankings. CBS Interactive. Retrieved May 4, 2008. ^ a b "Star Wars: Battlefront II for PlayStation 2 Reviews". Metacritic. CBS Interactive. Retrieved August 22, 2014. ^ a b "Star Wars: Battlefront II for Xbox Reviews". Metacritic. CBS Interactive. Retrieved August 22, 2014. ^ a b "Star Wars: Battlefront II for PC Reviews". Metacritic. CBS Interactive. Retrieved August 22, 2014. ^ a b "Star Wars: Battlefront II for PSP Reviews". Metacritic. CBS Interactive. Retrieved August 22, 2014. ^ EGM staff (December 2005). "Star Wars: Battlefront II (PS2, Xbox)". Electronic Gaming Monthly (198). ^ "Star Wars: Battlefront II (PSP)" (199). January 2006: 127. ^ Rossignol, Jim (November 10, 2005). "Star Wars: Battlefront II (Xbox)". Eurogamer. Retrieved August 23, 2014. ^ Reiner, Andrew (December 2005). "Star Wars: Battlefront II". Game Informer (152): 152. Archived from the original on February 12, 2008. Retrieved August 22, 2014. ^ Kato, Matthew (January 2006). "Star Wars: Battlefront II (PSP)". Game Informer (153): 157. Archived from the original on August 2, 2009. Retrieved August 22, 2014. ^ Vicious Sid (November 1, 2005). "Star Wars Battlefront 2 (PS2, Xbox)". GamePro. Archived from the original on January 18, 2006. Retrieved August 23, 2014. ^ a b Colayco, Bob (November 4, 2005). "Star Wars Battlefront Review". GameSpot. Retrieved August 22, 2014. ^ Colayco, Bob (November 4, 2005). "Star Wars: Battlefront II Review (PC)". GameSpot. Retrieved August 22, 2014. ^ Colayco, Bob (November 4, 2005). "Star Wars: Battlefront II Review (PSP)". GameSpot. Retrieved August 22, 2014. ^ Tuttle, Will (November 1, 2005). "GameSpy: Star Wars Battlefront II". GameSpy. Retrieved August 23, 2014. ^ Chick, Tom (November 4, 2005). "GameSpy: Star Wars: Battlefront II (PC)". GameSpy. Retrieved August 23, 2014. ^ Bedigian, Louis (November 2, 2005). "Star Wars Battlefront II Review - PlayStation 2". GameZone. Archived from the original on January 25, 2009. Retrieved August 23, 2014. ^ Valentino, Nick (November 13, 2005). "Star Wars Battlefront II - XB - Review". GameZone. Archived from the original on February 13, 2008. Retrieved August 23, 2014. ^ Giacobbi, Kevin "BIFF" (December 18, 2005). "Star Wars Battlefront II - PC - Review". GameZone. Archived from the original on October 20, 2008. Retrieved August 23, 2014. ^ Zacarias, Eduardo (November 9, 2005). "Star Wars Battlefront II Review - PSP". GameZone. Archived from the original on September 30, 2008. Retrieved August 23, 2014. ^ Castro, Juan (November 1, 2005). "Star Wars Battlefront II (PSP)". IGN. Retrieved August 22, 2014. ^ a b c d Sulic, Ivan (November 2, 2005). "Star Wars Battlefront II". IGN. Retrieved August 22, 2014. ^ "Star Wars: Battlefront II (PS2)". Official U.S. PlayStation Magazine: 108. December 2005. ^ "Star Wars: Battlefront II (PSP)". Official U.S. PlayStation Magazine: 104. January 2006. ^ "Star Wars: Battlefront II". Official Xbox Magazine: 90. December 2005. ^ "Star Wars: Battlefront II". PC Gamer: 54. January 2006. ^ a b Hruschak, PJ (November 16, 2005). "Star Wars Battlefront II". CiN Weekly. Archived from the original on December 2, 2005. Retrieved August 22, 2014. ^ a b Huschka, Ryan (November 13, 2005). "'Star Wars Battlefront II' (Xbox)". Detroit Free Press. Retrieved August 22, 2014. ^ "The NPD Group Reports Annual 2005 U.S. Video Game Industry Retail Sales". NPD Group. January 17, 2006. Archived from the original on December 10, 2006. Retrieved July 8, 2010. ^ Plunkett, Luke (January 4, 2008). "Your Most-Played Xbox Live Games For 2007 Were..." Kotaku. Archived from the original on January 6, 2008. Retrieved August 23, 2014. ^ Hyb, Larry (January 4, 2009). "The Top 20 LIVE Games of 2008". majornelson.com. Archived from the original on June 26, 2012. Retrieved July 20, 2010. ^ Hyb, Larry (January 10, 2009). "The Top 20 LIVE Games of 2009". majornelson.com. Retrieved July 20, 2010. ^ Pham, Alex (October 12, 2007). "EA buys strength in new genres". Los Angeles Times. Archived from the original on October 4, 2008. ^ PSW staff (November 15, 2005). "Star Wars Battlefront II review". Computer and Video Games (PlayStation World). Retrieved August 22, 2014. ^ Sessler, Adam; Webb, Morgan (December 12, 2005). "Star Wars: Battlefront 2 Review". G4TV. Retrieved January 4, 2012. ^ Hill, Jason (November 17, 2005). "Chaotic conflict". The Sydney Morning Herald. Retrieved August 22, 2014.